NBN Co's RFS dates are increasingly accurate - jxeeno blog. 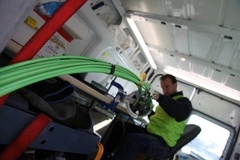 Since the election, NBN Co has consistently been providing expected ready for service dates that are more accurate than ever before (for areas less than three months from expected Ready for Service). These dates are now more realistic and achievable target dates — now that the company is without the pressures of the election and that some contractual disputes are resolved and Telstra has resumed remediating pits. From the data below, only 10 FSAMs of the 30 FSAMs were delayed from the last expected ready for service dates provided by NBN Co. Of the 10, only 2 were delayed over 15 days — with the highest being 23 days off (2CFS-06). Many other areas were on time or ahead of schedule. 6MSP-01 and 7BEV-01 were "brought forward" by over a month, perhaps due to contractual uncertainty being resolved in Tassie and construction work chugged along at full speed in WA. ^ — difference is calculated between the last provided RFS date and the actual RFS date. +ve dates indicate delays, -ve dates indicate "ahead of schedule"